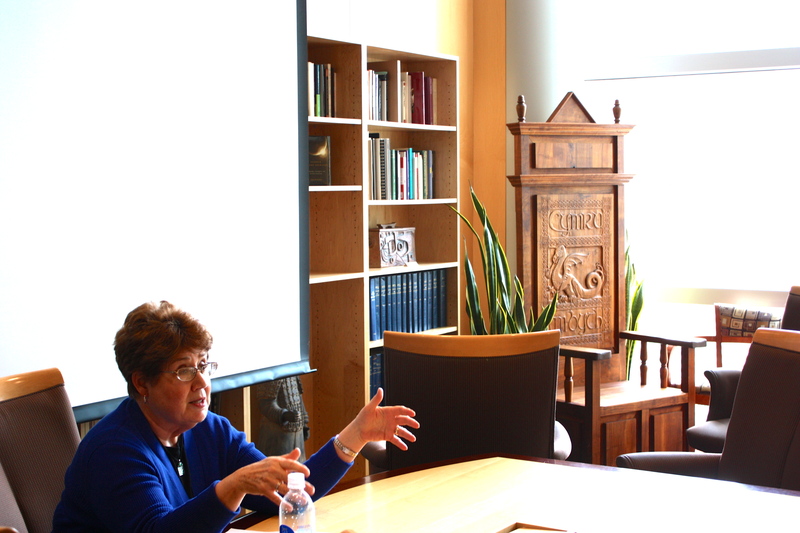 In a Humanities Center Colloquium lecture, Donna Lee Bowen discussed what a society’s level of clannishness indicates about the security of its women. PROVO, Utah (March 12, 2015)—There is one correlation that drives copious research and policy: What can the security of women tell us about the peacefulness of the state? Donna Lee Bowen from the Political Science Department lead a Humanities Center colloquium hinging on the tenet that women are a measure of the well-being of society, and analysis of women’s physical security says a lot about the health of that society. 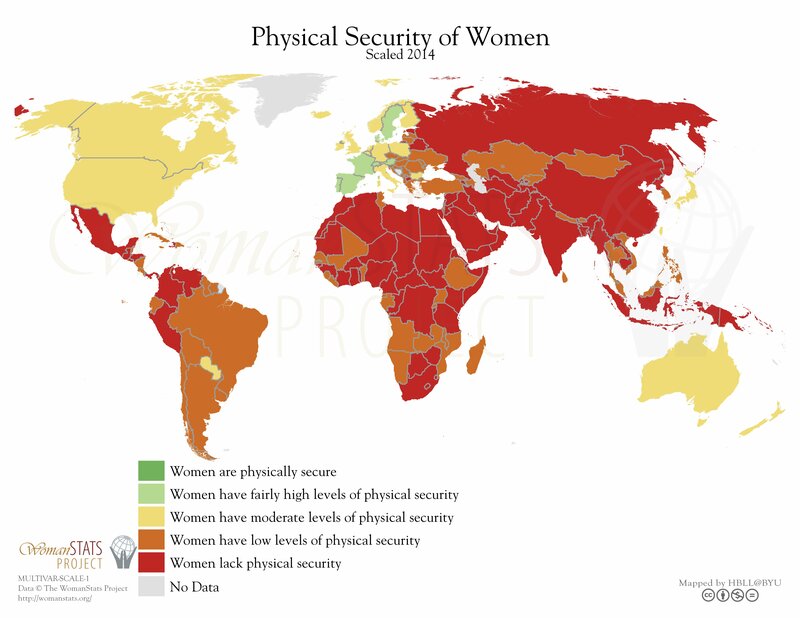 Showing a world map that indicates the physical security of women, Bowen said: “Look for the green. Do you see any dark green? That’s where women are in really good shape.” In looking at those bleak realities, with the United States boasting only moderate levels of female security, Bowen and her research colleagues – who include Valerie Hudson and Perpetua Lynne Nielsen – began to lay out research possibilities. “We thought, ‘there has to be a silver bullet somewhere that tells us what really causes the problems,’” Bowen said. “After a great deal of work, we found a great way to get at a difficult subject. What we’re looking at is the question of how states that have strong kinship-based groups, which are usually called tribes or clans, measure in terms of state peacefulness. Our theory is that in states where the tribes and clans are prevalent , we will see, , much lower levels of state peacefulness.” Our method of determining the level of clannishness in society is by measuring what we call a “severe patriarchy.” In other words, this particular research simply adds another variable to their already established theory that the security of women correlates directly with state security. This variable is clannishness and to what degree of clannishness the society operates. “Many of us think of tribes and clans are something that have vanished, but in many parts of the world tribes and clans are still very much important,” Bowen said. How tribes and clans are often identified is by their privileging of descent in the male line. “The most consistent characteristic of tribes across space and time may be its utilization of a severe patriarchy as the basis of their social organization.” Their research shows that nation-states with higher degrees of inequity in family law favoring males experience higher rates of violence against women. Many of these states face challenges to stability and security due to the enduring power of kin-based groups such as tribes or clans whose roots in society run deep. Bowen described the political and social order of these communities, in which clan leaders attempt to resolve problems quickly and decisively through established precedent in clan law. According to Bowen, “The key to the harmony which tribal leaders seek to maintain in order to prevent recourse to physical conflict relies on an intangible – an honorable reputation – which serves to strengthen the group and its individual members.” She went on: “Good reputation is mandatory for leaders of the clan, because the respect paid them by clan members makes the enforcement of their judgments possible.” For men, honor includes the vital characteristics of dignity, generosity, virility, courage, military prowess, hospitality, honesty and the ability to protect not only one’s family, but also the vulnerable. For women, honor includes chastity, virginity at marriage, obedience and deference to husband, family and clan, as well as the characteristics that apply to men. Bowen described tribal units as “status societies,” which mandate honorable behavior and condemn shameful behavior. “Control of women becomes a key component of the group’s honorable reputation. Women in status societies matter not as individuals but as components of the tribal or clan community,” she said. Analyzing women’s role in marriage in these societies, Bowen and her colleagues developed independent variables, which measure women’s severe subordination in marriage.